You have no time to take a cool drink from refrigerator during playing addicting online games? 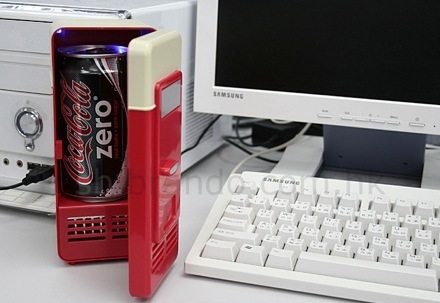 The USB-powered mini fridge which designed by Brando is big enough for one can of your favorite drink! With the ability to cool your drink down to 8.5°C (47°F) within 5 minutes, the mini USB fridge which connect to computer’s USB port will be more convenient for you to enjoy your drink just like what’s inside the photo. It just sit on your desk and keep your drinks cool! The USB mini fridge which costs about $33 seems like a good idea for the lazy man like me! Coca-Cola? Pepsi?